LONDON, England (CNN) -- Playing the Nintendo Wii Fit could improve balance and help avoid falls in seniors, researchers taking part in a new study suggest. Researchers in Aberdeen think playing Wii Fit may improve the elderly's balance and lower risks of falling. The University of Aberdeen, Scotland and the UK's National Health Service (NHS) have embarked on a four month study on people over 70 to observe any changes in balance after regular use of the Wii Fit. The video game has different activities including yoga poses, push ups, strength, balance and aerobic exercises. The Wii Fit includes a balance board that records movements and gives feedback on performance. Dr Marie Fraser, a specialist registrar at Woodend Hospital in Scotland, UK, is carrying out the research. She told CNN: "Falls are the most common cause of accidental injury in older people and the most common cause of accidental deaths in 75-year-olds and over." It is hoped that using the Wii Fit's balance board can improve elderly people's balance and confidence. Dr Alison Stewart, who devised the study said she came up with the idea while working in the Osteoporosis department at the University of Aberdeen, after seeing a large number of fractures in old people who had fallen. Stewart, a commercial research manager with the NHS, said she then decided to research how to improve older people's balance. She told CNN: "There exists a medical fitness device that improves balance, but it is expensive and I could not get the funding. "That's when I looked up the Wii and discovered it is very similar to the other equipment, but less expensive. "What is great about the Wii is it also has an entertainment value. The fact that it is enjoyable also makes the compliance rate higher." The latest study comes as another pilot study at Southern Cross University, Australia looked at the benefits of using the Wii to help Parkinson's sufferers. A group of seven older people with and without the degenerative condition took part in the pilot project, and were put through an almost daily regime of playing the Nintendo Wii. Associate Professor Rick van der Zwan who led the research said initial results were "positive." They ultimately hope to determine the effectiveness of computer games in developing muscle strength and co-ordination and reducing the risk of falls for people with Parkinson's. "People generally start to develop the disease in their 50s or 60s. It leads to inertia and people become unstable on their feet," said Van der Zwan in a media statement. "What we are trying to do is reduce the risk of serious harm. These people are nine times more likely to fall over than someone without the disease and falls in this older age group can be very serious." Van der Zwan now wants to recruit 15 more research participants to broaden the study. 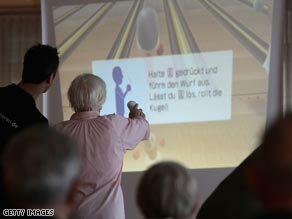 Since its launch in 2006 the Nintendo Wii has seen a huge rise in the number of elderly players. At one senior citizen home in north-east England, staff introduced the popular games console at Christmas in all five of its homes. "Everyone loves it and we noticed it has improved the physical fitness of residents who play," Rachel Todd of McArdle Care told CNN. Todd believes the device's entertainment value not only improves residents' fitness levels, but also their mental fitness. Among the Wii Fit fans at the home are 74-year-old Ian Fisher and 86-year-old Betty Dennis. "I always loved sports, particularly football" Dennis told CNN. "But I had a stroke six months ago and am now in a wheelchair." "Since the Wii I really feel movement in my right arm has improved, which is all I need to play skittles." Her bowling partner Fisher told CNN he recently played the boxing game on Wii Fit with his four-year-old great-grandson. "It really spans all ages, although my great-grandson knocked me out twice," the former bricklayer said.